A Blue and White tea cup. A sprinkling of Pink on heart shaped sugar cookies. A pair of White feather angel wings. As I continue to show you my Blue and White collection I would like to say how much I enjoy your visits to My Cozy Corner, and how much your comments and friendship mean to me. I can't explain the transformation I have made. Life is calm. I have found a new purpose in life. Gardening, Decorating, Photography and writing from my heart. A few heart shaped sugar cookies sprinkled with pink colored sugar. I just mix granulated sugar with pink food coloring gel and sprinkle it on the small heart shaped cookies before baking. Sweetheart and I have TWO each night with our ice cream while watching our favorite TV programs. I'm cuddled in a heated throw in my recliner and Sweetheart is sitting next to me with his feet up. I love the sliver tipped feather wreath around my candle. It really is a Christmas tree ornament I bought at TM. I found the drip protectors at Michael's craft store. The candle holder is a Anchor Hocking Berwick. I'm joining some wonderful parties and I would love to have you join me. Good Morning Betty, Firstly your table setting is beautiful. I adore your delicate blue and white tea cup and saucer. I can imagine you curled up, under your heated blanket enjoying your little heart biscuits during the evening. Absolutely beautiful, love those angel wings! Hi! Bee-you-ti-ful! I adore anything under a sweet little cloche! I've come to your delightful blog from Beverly's Pink Saturday ~ Now following you, my Dear! What a beautiful tea vignette. Love your blue & white teacup and the angel wings. The soft glow of the white candle looks so elegant and romantic. Happy Pink Saturday! Here's MINE, your comment is always appreciated. Coming back for Blue Monday. Ohhh i love your pretty angel wings! What a darling peaceful setting! So pretty! Your angel wings are magnificent. Oh you're having WAY too much fun! Thanks for joining Blue Monday, Betty. Love the pretty tea vignette. The angel wings are so pretty. Beautiful photos, have a happy week ahead. You did a very nice job on your table of feathers. Very pretty and ethereal! Love the teacup blue and white and the angel wings are lovely! Wish we had a Tuesday morning close...but we don't. I think there's one about an hour away, but...Thanks for linking to Tuesday Cuppa Tea! OI BETTY,EU GOSTAR DAS BOLACHAS FORMAS DE CORAÇÃO,MUITO BONITO SEU BLOG,PARABÉNS.BOA TERÇA.VALÉRIA.(BRASIL). What a pretty post! I love your angel wings. 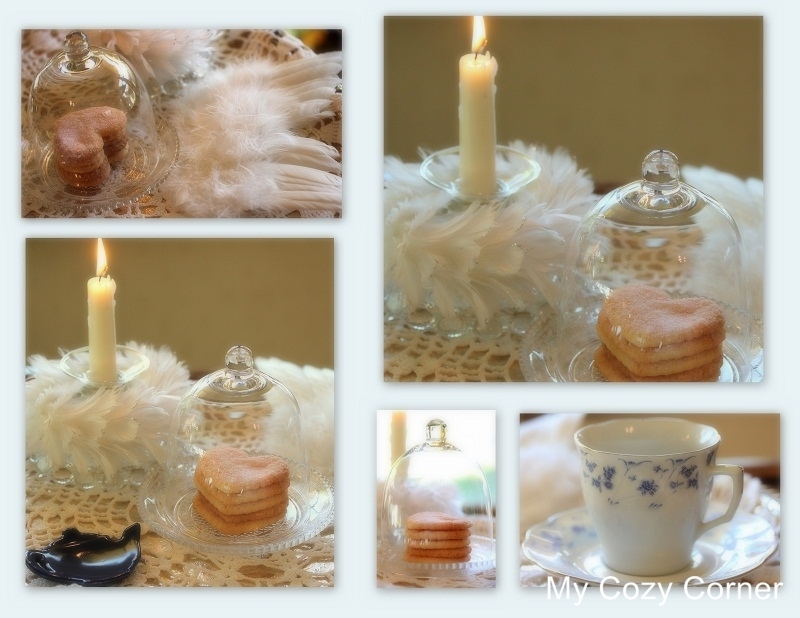 Your blue and white teacup is lovely and your cookies are so pretty sitting beneath the cloche! It is amazing to me that you can work in your garden this week. Here on the Island, our gardens are frozen solid and snow and ice lies everywhere. So happy you could join me for tea this week. It is always a pleasure to have you stop by. Enjoy your week and your gardening adventures. Hello Betty, What a delightful post! I loved hearing about your blogging journey and what it means to you. 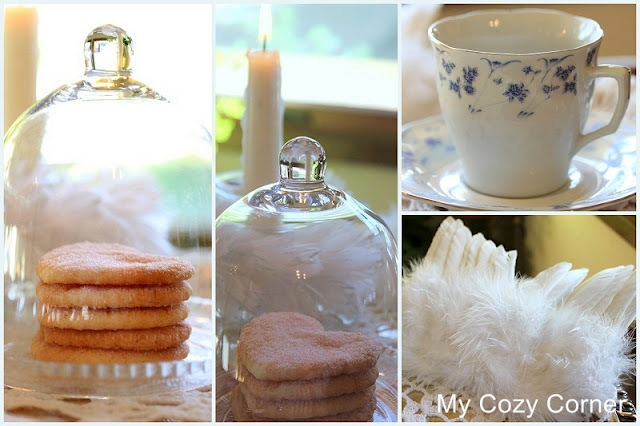 Your tea setting is very romantic in blue and white, and the angel wings really lend a soft touch! That is a sweet little cup there too! I love it's delicate beauty. Thank you so much for joining in T.T. Such a pretty tea today! Your blue floral teacup looks so lovely with the white angel wings and soft pink cookies! I just bought the cloche and dish like you have at a Ross store here in Florida and I'm sure I will be using it lots! Happy Tea day to you! Very fun Betty - hope the table setting doesn't "FLY AWAY". LOoks like a taste of heaven!! !JOy to you, today!